Material: ob Baumwolle, Kord, Strick, Fleece, Wolle, Walk, Teddy, gefütterte Stoffe: alles ist möglich. 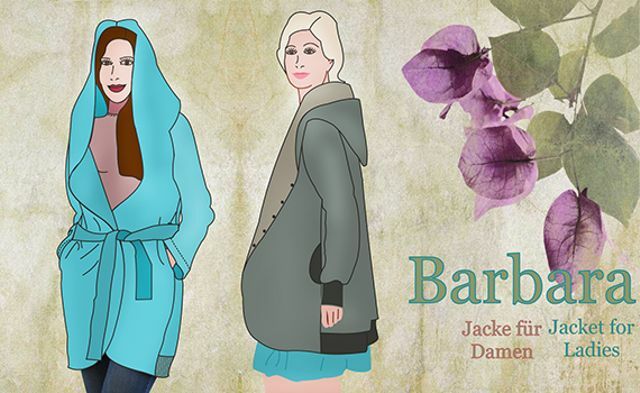 The jacket BARBARA may be sewn without lining, with lining or as reversible jacket. All types of fabric are suitable for pattern BARBARA: cotton, corduroy, knitwear, fleece, wool, walk fabric, teddy fabric, fabrics with lining: all types may be used. The model no. 1 is sewn quickly and easily and therefore also apt for beginners. The sewing instructions are in German, English language.